‘First’ is a small country station on a fictional narrow gauge line in the Cotswolds, in the early 1930s. The main goods traffic is livestock, wool, limestone and beer from the local brewery. There is a good passenger service. Surprisingly, the locals still find it convenient to travel in slow carriages with hard seats. ‘First’ is just that, my first ever layout. I wanted to build a small layout to try out every aspect of the hobby: building baseboards, laying track, electrics, creating scenery and making stock. I must admit I didn’t have a plan when I started and the layout has just evolved. It has been a lot of fun and I’ve learned a lot… but I definitely wouldn’t build another layout without a plan! ‘First’ is built in OO9, which is OO scale (4mm to the foot, 1:76) on track that is 9mm gauge (N gauge). As you can see, it is possible to build very compact layouts in OO9. ‘First’ appeared at the Beds and Bucks NG Modellers Open Day in 2016 and the Norfolk and Suffolk NG Modellers Exhibition in 2017. 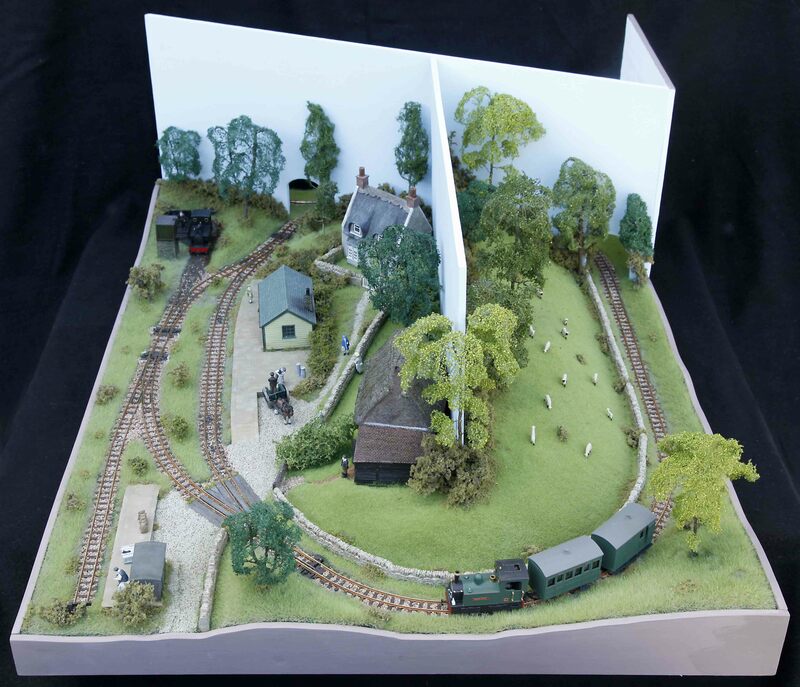 In 2018 ‘first’ appeared at Narrow Gauge South, the Beds & Bucks Narrow Gauge Modellers Open Day, the Oxfordshire Narrow Gauge Modellers Open Day,the Norfolk and Suffolk Narrow Gauge Modellers Running Day and ExpoNG. I’d love to take ‘First’ to more narrow gauge exhibitions, so if you are looking for a small layout to fill a corner at your narrow gauge event please contact me.